were trying to decide who would look like a bigger moron. Personally, I think I won that one, it has to be more embarrassing being the one in front of the camera, especially when trying out your best 'ooh look at that bird in the distance' or 'there's something interesting on the floor' poses. His argument was that he would look like the artsy fartsy photography student trying to capture his muse, or something along those lines! So I thought I would ask what you think, do you feel like an idiot in front of the camera? if you like photography, follow mine please? Absolutely stunning, love your hair and the dress is fab!! That dress is gorgeous, I'd feel a bit awkward out in posing in front of the camera but I guess people can get used to it. that hat looks beautiful on you. my head never looked good with hats..but you look perfect. hmm I don't know, I think you both have good points for looking silly! Haha! I always feel embarrassed taking photos outdoors too. You look lovely, your hair looks nice ombred. I feel like an idiot in front and behind the camera! hehe Sometimes an occasion calls for a weird position to get a photo of something no one else sees anything interesting about. But it usually makes for an awesome picture. And I've never been very comfortable posing in front of the camera for people. I'm better doing my own pictures but only in a secluded spot. I feel dumb most of the time, even though I take my own pictures. Especially when one of my family members decides to walk in and stare at me mid-pose! I like the dress; Topshop has been coming out with some nice stuff lately! Definitely more awkward being the one having your picture taken. Ha boys are so silly! Anyways you look really lovely. I love the simple beauty of your dress, it's wonderful. Love this look, that dress from topshop is so cute and I like how you have given it an edge with the hat. And Yes, I feel so awkward taking pics out in public, I just can´t do it because I blush so badly! This dress looks perfect on you and I love the hat. I feel stupid taking just taking photos on my own with my tripod - it's annoying. Thanks, for commenting on my post. I picked up the coat in the sale but I did spot the camel one and prefered it. always feel like an idiot in front of the camera....my face gets all nervous and changes! I love that dress, although I tried it on and it looked awful on me! It definitely looks a million times better on you! And yes, I feel like a pillock which is why I tend not to do them, but hopefully I'll get more comfortable with it after practice! Yes i do but your photos turned out really cute! What an adorable blog! I am in love with your adorable style! you always look fantastic. 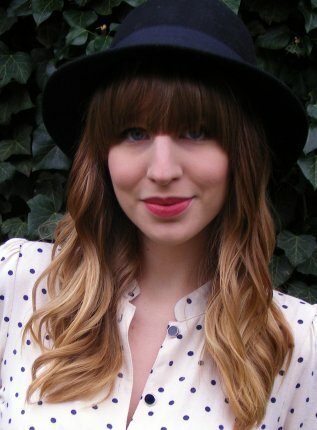 Makes me want bangs again! Your boyfriend is a lucky guy and that shirt/dress is fab. Thank you so much for your kind comments! Your blog is fantastic!!!! I LOVE this outfit! That dress is perfect and I am in love with the hat! thanks for the cmt... lovely blog !! hyped! darling top, and you have gorg hair! i will surely be on the lookout for those american flag pants! thanks for the comment and you look amazing. stunning! love the hat and your hair is devine. love your hair, so gorgeous! Beautiful! Love the slight two tone look to your hair.